Global Plant Milk Market size was worth over USD 8 Billion in 2016 and will surpass 10 Billion Litres by 2024. Shifting consumer preference for lactose free and vegan alternative food & beverages due to increasing awareness for healthy diet will propel plant milk market growth. Growing consumer base for plant based food products coupled with rising number of dairy alternative product launches are among key factors driving industry demand. As per analysis, new product launches in dairy alternatives witnessed growth over 20% from 2012 to 2016. Increasing health concerns including overweight and diabetic diseases have encouraged the adoption of non-dairy substitutes over dairy products. As per industry experts, global per capita fluid milk consumption decreased by close to 23% from 2000 to 2016, while consumption of non-dairy plant milk substitutes grown by triple digits through the same period. As per analysis, global dairy alternative drinks industry is expected to surpass USD 16 Billion by 2018. Regulatory compliance including ProVeg International, Peta and Veganuary will support product demand. Lactose intolerance and allergy among consumers are among major factors fuelling plant milk market size. Moreover, rising awareness about gastrointestinal diseases and stomach flues caused due to dairy products will drive the industry demand. Extensive product portfolio including soy, almond, coconut and rice products will support product penetration. Abundant availability of raw material particularly in Asian countries will drive business growth. Rapid growth in global beverage industry will propel industry growth. Global beverage industry registered over 900 billion litres in 2016. Intense competition among manufactures influencing drop in production costs will enhance plant milk price trend. Enhanced production process including extraction from rich sourced raw material has encouraged product development. Improved distribution network and procurement process supported by online sales channels are major factors supporting industry growth. Increased preference for dairy products for infants coupled with price sensitivity may restrain the industry growth. As per NMPF, the product being referred as milk is anticipated to hamper industry demand. However, introduction of standards to reconsider non-farm products by NMPF and USFDA will enhance product demand. Soy is expected to value over USD 8 billion by 2024. Surplus product availability with varying fat content, blends, flavours and formulations has enhanced product demand. Increased awareness for soy as the oldest option available to substitute dairy products will positively influence industry share. Additionally, rising consumer awareness regarding nutritional benefits of soy-based products coupled with easy product accessibility will propel product demand. Coconut plant milk market will witness CAGR over 13% up to 2024, owing to health benefits associated with the product. Enhanced body immunity leading to prevention of several diseases will drive product scope. Rising demand for lauric acid present in coconut to maintain blood pressure and cholesterol level along with prevention from strokes or heart attacks will significantly enhance product penetration. Mainstream stores accounted around 80% of the plant milk market share in 2016. High consumer reliability along with growth in retail industry has enhanced the industry demand. Improved convenience for shopping accompanied by promotional strategies are the key factors driving product demand. Rising number of mainstream stores globally along with increasing disposable income will propel business demand. Specialty stores will witness growth over 13% up to 2024. Strong outlook for organized niche marketplace across the globe will boost industry size. Extensive product availability in carton, bottles and pouch packaging will drive product demand. Unsweetened formulation will witness gains exceeding 12.5% up to 2024. Increasing health consciousness among consumers along with availability of healthy product alternatives in plain form will propel product demand. 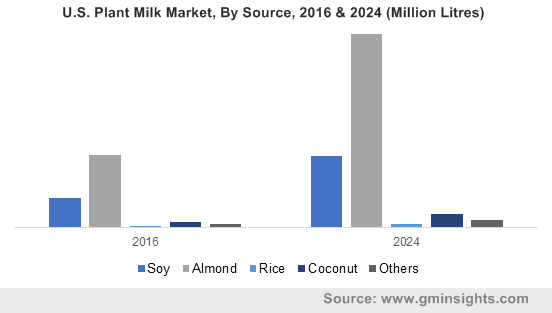 Moreover, rising demand for unsweetened soy and almond products to further manufacture numerous food products including cheese, desserts and yogurt are factors positively influencing plant milk market growth. Sweetened plant milk market is anticipated to worth over USD 9 Billion by 2024. Increasing consumer preference for better taste due to changing food habits will fuel industry growth. Product development and innovations including added flavours of chocolate, peppermint, strawberry, rose and vanilla are key factors supporting product penetration. Carton packaging accounted for over 65% of the global plant milk market share in 2016. Potential outlook for packaged food products due to convenience in carrying & transportation along with recyclable properties will drive the demand. Improved product safety without added preservatives or additives along with innovative packaging designs are the supporting factors of industry growth. Bottle packaging will witness growth over 12.5% up to 2024. Increasing environmental concerns regarding plastic disposals is among major factor supporting preference for bottle packaging. Government initiatives and promotions for reusable and environment friendly material will propel industry growth. Technological advancement including introduction of bisphenol A (BPA)-free polymer and tritan used for bottle production will further enhance industry demand. Asia Pacific is the fastest growing region with CAGR over 13% up to 2024. Increasing consumer consciousness pertaining to healthy diet and health benefits of non-dairy drinks will propel industry demand. Growth in consumer goods industry particularly in China, India, South Korea and Japan will support business growth. Rapid urbanization along with liberalization of FDI are major factors driving industry demand. North America accounted for over 25% of global plant milk market share in 2016. Changing demographic and income trends along with increasing preference for vegan food will propel industry growth. Expansion in the dairy alternative drinks market due to growing health issues caused due to dairy products has enhanced product demand. Global plant milk market share is moderately fragmented owing to presence of large number of regional and international manufacturers. Some of the major industry participants are Ripple Foods, Danone, WhiteWave Foods, Archer-Daniels-Midland, Hain Celestial Group, Califia Farms, Daiya Foods and Freedom Foods. Other prominent players include SunOpta, Blue Diamond Growers, Eden Foods, Nutriops and The New Barn. Rising competition among novel entrants and existing industry players is projected to stimulate new product launches over forecast period. Several manufacturers are expected to adopt strategic expansions including partnerships, mergers & acquisitions and supply agreements to enhance their customer base. Increasing incidences of lactose intolerance and allergies will positively influence consumer preference over forecast period. Rise in vegan population particularly in India, Taiwan, Australia and New Zealand will propel product demand. Intense competition among manufacturers has caused rise in research and development initiatives to further lower product prices. High potential of vegan food & beverage products will support industry demand. Furthermore, development of well-organized supply chains by various industry player will significantly enhance industry growth.